RICHMOND, Virginia, May 30, 1964 – Lieutenant General John Taylor Selden, U.S.M.C., retired a veteran of both World Wars and the Korean conflict, died here early today in a hospital. He was 71 years old. General Selden, who lived in La Jolla, California, was stricken while visiting his sister, Mrs. Douglas Vanderhoof. The General, who retired from the Marines in 1955 after 40 years of service, was a native of Richmond. He enlisted as a private in 1918. During World War I he served aboard the USS Huntington on convoy duty and later served in Florida. In the early nineteen-twenties he was stationed in Haiti as Chief of Police as Cape Haitien. He was sent to Shanghai in 1927 for duty with the Sixth Regiment, and from 1930 to 1932 he was assigned to the American Legation in Peking. After service in the Pacific, he became Chief of Staff of the Marine Training and Replacement Command, San Diego area, in January 1945. From 1946 to 1947 he was Chief of Staff of the Troop Training Unit, Amphibious Training Command, Pacific Fleet. The General served as Deputy Camp Commander of the Marine Barracks at Camp Lejeune, North Carolina, and was Commanding General of the Troop Training Unit at Coronado, California, when he was assigned to Korea early in 1952. 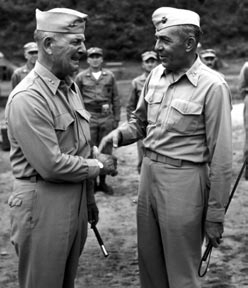 He was Commanding General of the First Marine Division for almost a year and received the Distinguished Service Medal. Among his other decorations are the Legion of Merit with gold star and the Bronze Star. General Selden was Commander of the Marine Corps base at Camp Pendleton, California, when he retired. Survivors include his widow, the former Gladys Glover; a son, Commander Claiborne Taylor Selden, and his sister. During World War II, he had commanded the 5th Marines on New Britain and served as Chief of Staff, 1st Marine Division, in the conquest of Peleliu in the Palau Islands. After leaving Korea, he served on the staff of the Commander in Chief, U. S. Forces, Europe, until 1953 when he assumed command of Marine Corps Base, Camp Pendleton, California, from which post he retired in 1955. 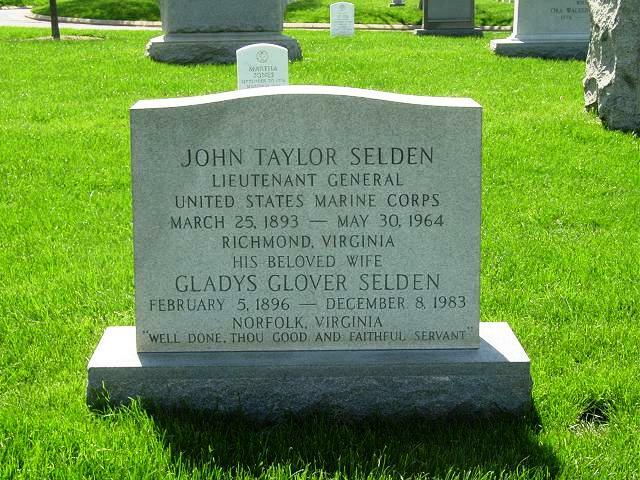 General Selden died in 1964 and was buried with full military honors in Arlington National Cemetery. Born at Richmond, Virginia, in 1893, Selden enlisted in the Marine Corps in 1915 and was commissioned a second lieutenant in July 1918. Instead of being sent to France, he received orders to convoy duty in USS Huntington. Between the World Wars, he served in Haiti and China and at various posts in the United States. He attended the Senior Officers’ Course at Marine Barracks, Quantico, Virginia, joined the 1st Brigade, which formed the nucleus of the 1st Marine Division, and participated in maneuvers at Guantanamo Bay, Cuba. When war came, he served in a variety of assignments in the Pacific before joining the 1st Marine Division in time for the New Britain campaign.